The i-Spec® series is a group of portable broadband fiber-optic coupled spectrometer systems for field, laboratory, and at-line use. The spectrometers cover 350 – 2200 nm and employ CCD, Si Array, InGaAs array, and/or extended InGaAs array detectors for optimal sensitivity and dynamic range in the Vis and NIR range. 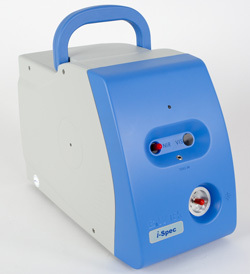 The i-Spec features a standard external triggering port with flexible fiber optic coupling of reflectance/transmittance fiber optic probes (standard) or other sampling accessories. Optimal transmittance or reflectance measurements are taken using long-lifetime 5 or 20 watt tungsten halogen sources. High speed detection systems enable fast spectral capturing of 20 to >100 spectra per second, making the i-Spec ideal for studies where high- speed spectrum capture rates are essential. The system includes a fiber optic probe for easy diffuse reflectance and transmittance measurements of solids, liquids, gels and slurries. The iSpec 4 software provides an easy user interface to control and optimize measurements with each of the system’s spectrometers.